1. Do NOT publish an obituary. While publishing an obituary is a good way to let people know that someone has died and to publicly celebrate his or her life, it is also an invitation to criminals for things such as identity theft of the deceased as well as the robbery of the deceased’s home if the belongings in the home have not been secured. 2. Determine how the decedent owned his or her assets. In Texas, assets that are owned as “Joint Tenancy with Rights of Survivorship” do not pass under a Will through the probate process, but rather pass directly to the surviving joint tenant(s). This can be a good mechanism for avoiding probate, but should be used with caution as it can have some unintended consequences to the estate planning of an individual. 3. Locate the Will of the decedent. If the decedent did not have a Will and there are assets that need to be distributed, there may be a number of options available depending on the circumstances. You should contact a probate attorney to determine the best approach, which will vary in cost according to your needs. 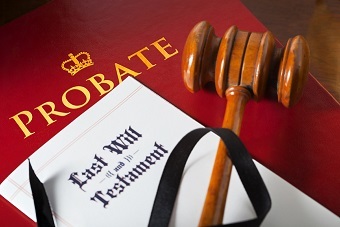 If there is no Will but there is a need to administer the estate, a probate attorney can help you determine the most cost-effective approach to administer the estate, which will likely cost more than if the decedent had died with a valid Will. 4. Gather all financial documents of the decedent. You should collect all of the financial statements of the decedent, including (but not limited to) bank statements, credit cards, mortgage information, and retirement plan account information. Compiling the information in these statements will give you a good idea of the financial position of the decedent, and will let you know how much will be available to distribute to the estate beneficiaries after any debts have been paid. 5. Make sure to file the last income tax return for the decedent. Usually there will need to be a final income tax return filed for the decedent, and the estate administrator usually handles this. It is often a good idea to employ a CPA to file this return. 6. Make sure any required distributions get made from retirement plans. If the decedent had any retirement plan assets, such as a 401k or IRA, the beneficiaries of those assets must usually begin taking required minimum distributions from those accounts following the death of the plan participant. Your probate attorney can help you coordinate with the plan administrator to make certain that those distributions are timely made. While the loss of a loved one is difficult, a little knowledge of the estate administration process in Texas, along with the advice of a qualified probate attorney can help you navigate this difficult situation much more easily.